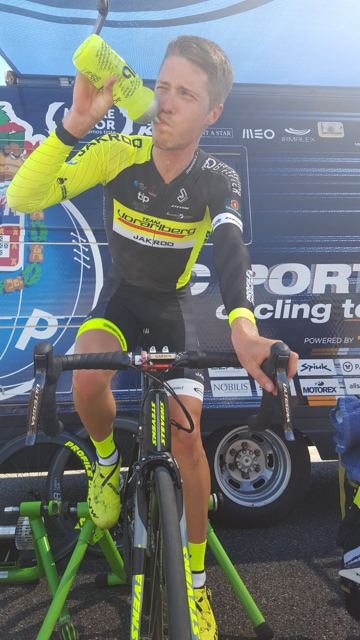 Schelling shows great performance at the first mountain climb on the fourth stage of the Volta a Portugal - With rank 13 Schellling is in a good position of the overall evaluation! Today's stage was really in itself. A hell of a pond today also from the start of the section in Macedo de Cavaleiros. To the finish on the Alto da Senhora da Graça, above Mondim de Basto, there were still several challenges facing the drivers. Many altitudes, incredible spectators on the interesting sections and the super heavy final (800 heights). A top group maintained its lead in the lead with two minutes in the lead. In the ten kilometer long climb then the Portuguese teams then fireed correctly. "They are stormed as if there was no tomorrow - really incredible the level here at the tour. The tempo was won by the teams FC Porto 52, Efapel u. SC Tavira was so high that the group of followers quickly declined. I was able to stay in the lead up to two kilometers before the finish line, but I had to break a bit, but my pace went up. There are still tough days, but today is a good one! "Says Patrick Schelling directly after the race! The yellow "Raul Alacorn" wins the Alto da Senhora da Graca - Schelling on the way forward in the overall evaluation! In the elimination race, Spaniard Raul Alacorn (FC Porto52) will be the winner before his team-mate Armano Antunes (POR) and the Italian Ninaldo Nocentini (SC Tavira). After a hearty and great fight, Schelling is now a very good 13th with 46 seconds behind, and he is one of the few middle-European leaders to take the lead. He jumps from rank 27 to rank 13 with 1min 59sec on leader Alacorn. With this performance can be more than satisfied. The organizer is very impressed with the achievements of the Team Vorarlberg crew! Stage 5 - Up and down from the start to the final! Tomorrow, too, many drivers are waiting for the drivers - there will not be any boredom tomorrow. Shortly after the start of Boticas the first downhill, and also towards the final in Viano do Castelo, the graphic card shows a slope. For this reason, the stage has a lot of heights and 179.6 kilometers.